Potatoes are one of my favorite foods. Baked, mashed, roasted, fried, hashed, in a salad – there are so many ways to enjoy these scrumptious tubers. 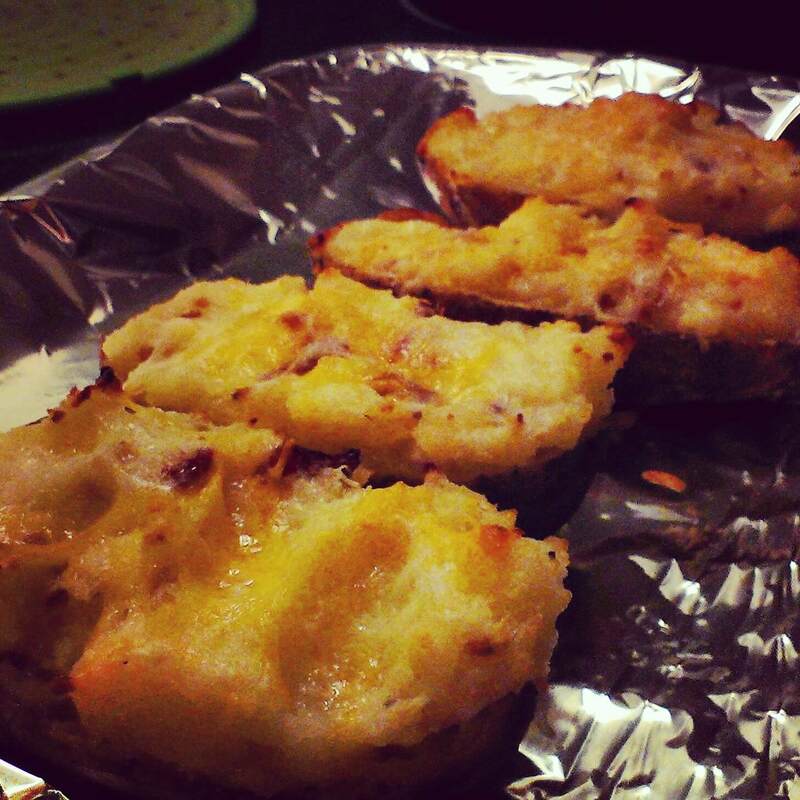 One of our family’s favorite potato dishes is Twice Baked Potatoes. Unfortunately, we don’t get them very often because we rarely have leftover baked potatoes!! One night last week, I just wasn’t very hungry at dinner, so I put my baked potato in the fridge. Originally I had thought about scrambling it with some eggs for breakfast, but then I got the idea for Twice Baked Potatoes. I texted Art and told him my idea. If he wanted some too, he would have to bake a potato while I was at work. He agreed, and even suggested the addition of bacon. I’m glad he did!! It really helped make the meal. 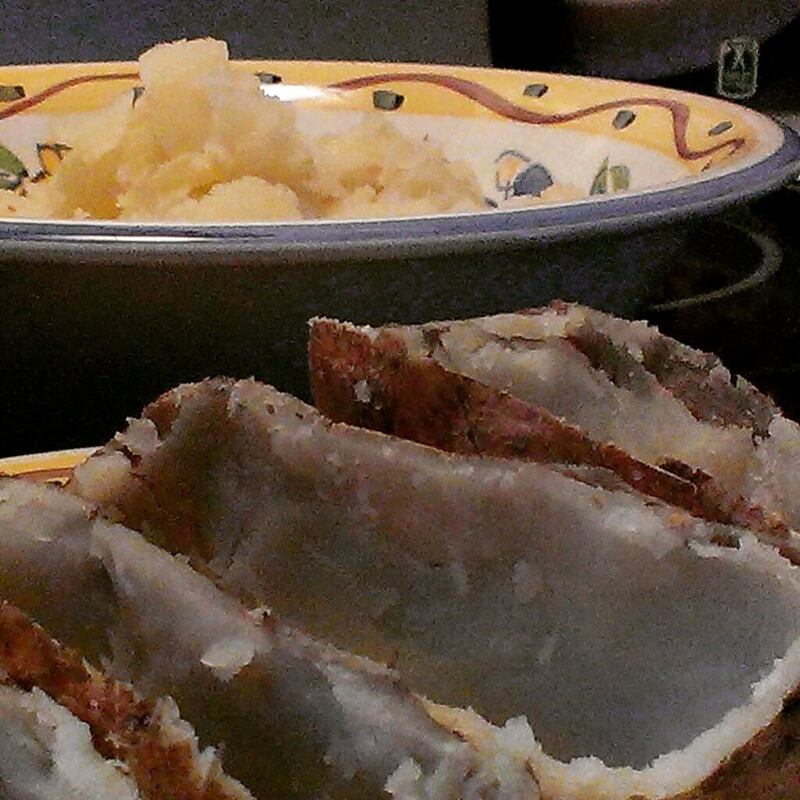 Bake potatoes as you usually do. Let cool. Cut each potato lengthwise in half. Scoop out the inside, leaving a thin shell. Mash potatoes in a bowl until no lumps remain. Add butter and beat until smooth, but stiff. Add milk in small amounts, beating until smooth and fluffy. Stir in salt, pepper, 3/4 of the cheese, and onion powder. Fill potato shells with mashed potato mixture. Place on ungreased cookie sheet. Top with remaining cheese. Bake at 400F for about 20 minutes or until hot. This is my favorite way to have potatoes. So much better than wasting the peel. I like to mix in Broccoli too. Yummy!! I’ll have to try it with broccoli next time. Oh, man, those looks great! I would add even more bacon, lolol! 3 of my favorite foods are combined here: potatoes, cheese & BACON!! I enjoy any potato recipe. This one looks different and delicious for me to try.